And far too soon, so will snow. New fence just keeps not happening, and there’s weeks of forage out there. We weighed on of the Chantecler cockerels in the hopes that they would be ready for slaughter, since we are doing the drakes on Sunday. We bought them because (among other reasons) they were supposed to reach 8.5 lbs. Unfortunately ours are 4.5-5, and now we’re told that’s all we can expect from hatchery chicks. Ouch. I wonder if we can buy an 8 lb. roo or two and breed up. We think we’ve finally managed to keep the chickens out of the garden, which in turn should get us some tomatoes. Two foot poultry net above the four foot woven wire, and poultry net stapled to the pallet gates. That will definitely help the tomato and cucumber harvest. The peppers just don’t seem to be setting any fruit despite being big and bushy. I’m pulling a few tomatoes and tomatillos out of both the old and new pigs areas. They’ve taken to eating the squash themselves, which I’m fine with. After three years of random hybridization, the fruits down there are getting decidedly strange. After the rain on Thursday night, we checked the ‘shroom situation today. 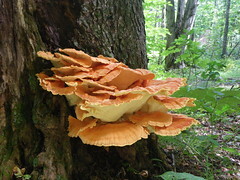 We found a really nice looking chicken of the woods, on the same dead cherry tree we found one on two years ago. We still have a bunch frozen from last year’s 26 pounder, so we took pictures and are trying to sell it to a chef before we harvest it. Other than that, a double handful of trumpets and a dozen boletes. Many, many beige Russulas also, but we find them more ‘nontoxic’ than actually edible. I got in to take another look at the bees as well. Everyone is queenright, hooray, but no honey, boo. The may split is doing best, they’re storing honey into their upper hive body. If there’s a good Japanese Knotweed run we might just get some honey. 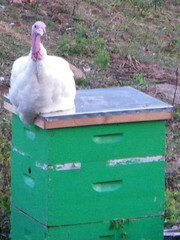 The original hive has brood in the upper super, but no honey yet. Their new queen took a long time to start laying so their population isn’t very good. With good honey flows in the next six weeks they should be fine. I’m wondering when to start feeding them. The problem is that feeding them sugar syrup means giving up on getting any honey. The new split has good population, but a lot of black plastic frame to draw. It looks like they may be putting burr comb in the honey super I fed them from rather than drawing the plastic, which they don’t like. I didn’t see any honey there, but as soon as I remember to bring a bee excluder up from the storage trailer, I’ll put it on so they have to deal with the plastic. I’ll start feeding when I pull the super. I am going to get the area between the house and Baine Rd. fenced with high tensile this year. Even in time for Danny and the horses to eat it. So far, I’ve got Mack Hill Rd. and the 600 feet of Baine Rd. cleared, with insulators up. This leaves the 800(ish) feet back to the beaver pond to do. I figure two afternoons for that, and two more (with Lisa’s help) to run the wire. There’s enough post and rail stockpiled to finish the garden. That comes next, and then I fear it is firewood time. This entry was posted in Bees, Black Trumpet Mushroom, Chickens, Ducks, Fencing, Gardening, Harvesting, Peppers, Tomatillo, Tomatoes. Bookmark the permalink. Post a comment or leave a trackback: Trackback URL. How are you coming with the plans for the barn? We have plans and a cutting list. It’s the cutting that is the hang up. Right now I’m cutting oak for fences and pig arks. Also I’m deliberately choosing oaks that are shading sugar maples.